3.1 out of 5 based on 29 bloggers and 8 commenters. To edit the Menu you need to search and edit the links directly in your template code. In order to make the slider work, you need to edit the corresponding HTML gadget, writing down the name of a Label in the content box. E.g. if you write 'Featured', the slider is going to show all the posts with that specific label. 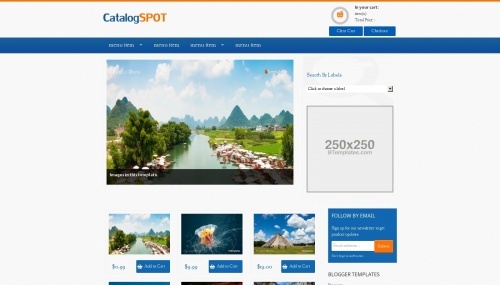 Catalogspot is a free premium blogger template with 2 columns, right sidebar, gallery-styled, an exclusive design for Blogger, ads ready, footer columns, slider, posts thumbnails, drop down menu, pagination, a background pattern and well designed threaded comments. Excellent template for blogs about business, a personal portfolio site or an online store. I need to use this template for India. How do I change the currency from USD to Indian Rupee…. I am tryning to download the template Catalogspot, but applying the download button you always obtain the template Paperlaunch instead of Catalogspot. Is possible to correct this error or if possible you can send me a link to download the correct one Catalogspot? ¿Como puedo adaptar esta plantilla para Colombia y Pesos Colombianos? i love this template,but can i download this template as blogger i.e blogspot.com and can it be allow by google base on the selling stuff? How to edit parts slide it work? I am tryning to download the template Catalogspot, but I dont know how applying the price correct in template Catalogspot? please give me some steps to do that.